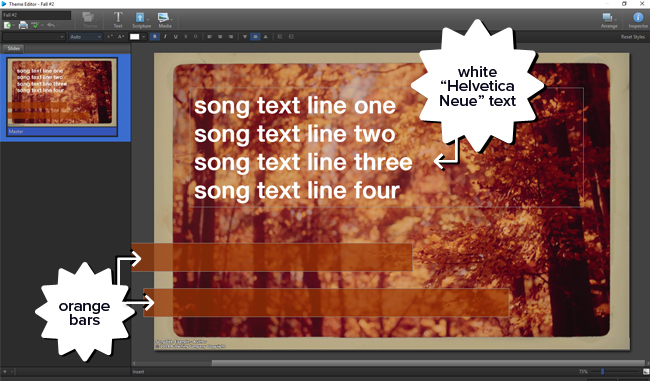 Create a new Song Theme in EasyWorship. Resize the text box to fit the text as shown in the image below. I extended the text box to the right because it provides extra room for longer lyrics to stay on the same line. To create the two bars on the bottom, add another text box by selecting the “Text” button on the top bar. Repeat this step. 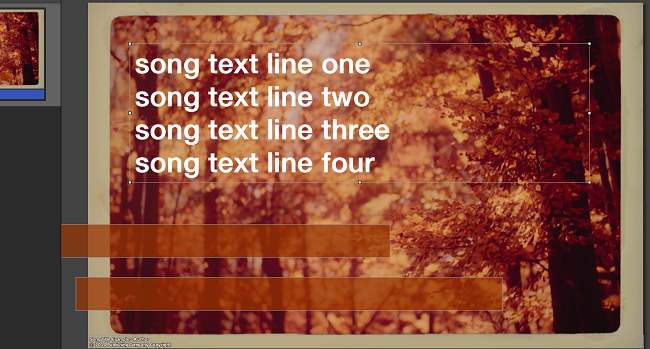 Resize the first additional text box to the size of the bottom orange bar. 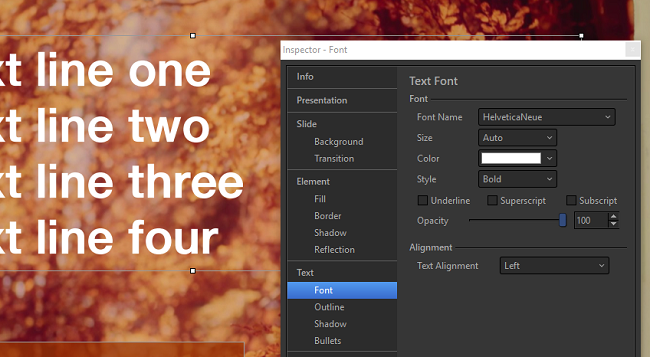 Resize the second additional text box to the size of the top bar. If you wish to remove the text for these additional text boxes to make it easier to work with, just double click and press the space bar. Keeps the “Double Click to Enter” from showing up. 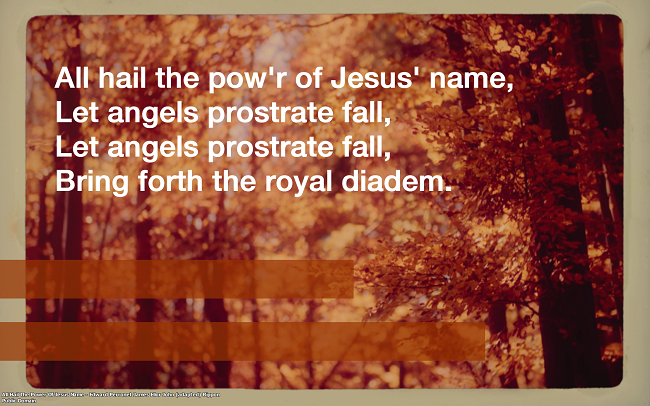 You may notice that I’ve allowed the edge of these additional text boxes to go over the slide on the left side. That’s just an easier/lazier way to do it rather than making sure the edge of these text boxes fits exactly the edge of the slide. 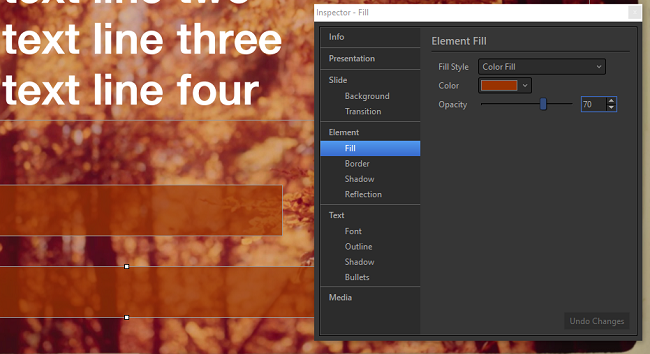 Select the first additional text box, and then go to Inspector and select “Fill” under Element. For the Fill Style, select Color Fill. For the Opacity, select 70. Repeat for the second additional text box. With Inspector still open, select the actual text box where the lyrics will go. In Inspector, select “Outline” under Text and remove the outline. Select “Shadow” under Text and remove the shadow. Change the Font to HelveticaNeue. You may need to download this font and add it to your computer. If you can’t do this, sticking with Tahoma is a good substitute. Close Inspector, name this new Theme, and select OK. You’re finished! Again, with this design as with any design that I share with you, feel free to adjust spacing, opacity, shadows, color or anything that you think will make this more readable for your house of worship. Previous Post Where’s your field? Casii Stephan has been a church administrator and communicator for 15 years both in Tulsa, OK and South St. Paul, MN. Currently, she works as the Media Store Manager at EasyWorship (easyworship.com) where she enjoys connecting churches with the right worship media.